Home » Our Doctors » Simon S. Yeung, O.D. Dr. Simon S. Yeung received his Bachelor's of Science degree from the University of Alberta with first class honors. 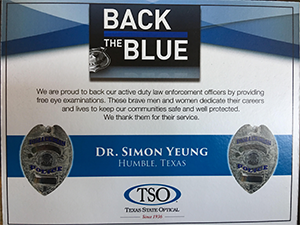 He earned his Doctor of Optometry degree from the University of Houston and was awarded BSK honors graduate, as well as becoming a member of the Optometric Honor Society's honors fraternity. 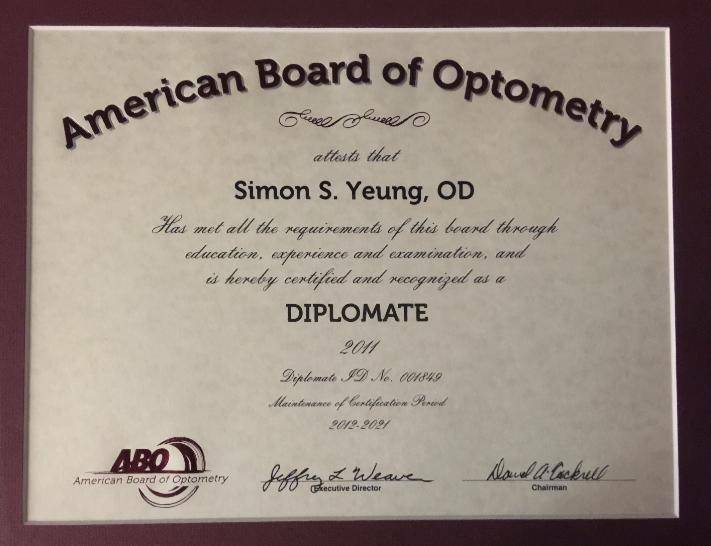 Dr. Yeung passed rigorous examination and demonstrated dedication to providing quality patient care, and was awarded American Board of Optometry board certification (as seen below). Dr. Yeung originally hails from Hong Kong, and decided to enter the field of eye health care primarily due to the influence of his uncle, a successful physician. 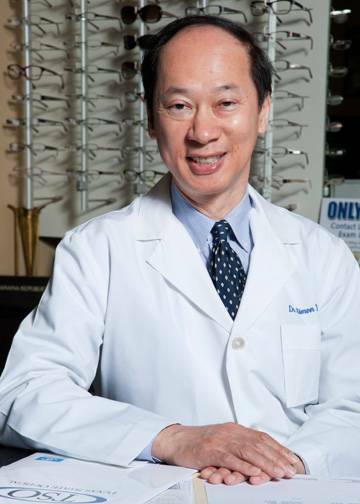 Dr. Yeung has been practicing for 32 years, and specializes in numerous important areas of eye care, including dry eyes, blepharitis, glaucoma and diabetes. Dr. Yeung is an active and involved member of his professional community. He is the immediate past chairman of the board, TSO 2012, and is the treasurer of TSO for the year of 2013. Dr. Yeung has been married for 32 year, and raised two sons, the older son is in Medical School, and the younger is following in his father's direct footsteps, and is applying to Optometry school. Dr. Yeung enjoys traveling, playing tennis and working out in the gym. He dedicates many weekends to educating the next generation and serves as a teacher in Sunday School.